Intimate partner violence (IPV) affects 4 in 10 women in North America in their lifetime and 13–27 % in the past year. The basis for estimates stems largely from studies involving Caucasian women. Less is known about other minority populations such as South Asian women. This study aimed to assess the prevalence of IPV in the past year among South Asian women living in Southern Ontario. We conducted a survey of South Asian women living in Southern Ontario. All adult self-identified South Asian women attending a cultural event celebrating South Asian women who could understand English or Punjabi were eligible to participate. The survey contained three IPV prevalence questions adapted from the Woman Abuse Screening Tool. A total of 188 women (45 % of potentially eligible women) participated. Nearly 1 in 5 women reported IPV within the past year (19.3 %, 95 % CI 13.9–26.1 %). In this study single women were significantly more likely to have experienced IPV in the past year compared to married women (p = 0.035). 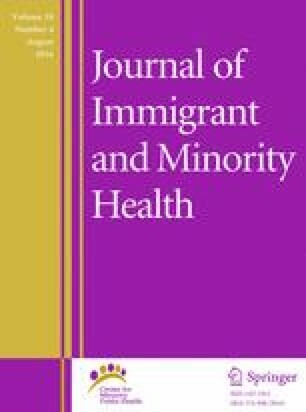 Self-identified immigrant and non-immigrant South Asian women in this sample of women living in Southern Ontario experienced violence in proportions comparable to the general population. Programs for women should ensure accessibility and support of all ethnicities given equivalent rates of violence in the community. The authors would like to thank Patricia Hoyeck for her assistance with data entry, and Sonia Dosanjh, Fargol Mostofian, and Meha Bhatt for their assistance with data collection. The authors would also like to thank the organizers of the Sisters’ Festival for facilitating recruitment of participants at their event. We would like to thank the PRAISE Investigators for the use of a subset of data from the PRAISE study. Ms. Madden is funded by a Canadian Institutes of Health Research Doctoral Award. Dr. Bhandari is funded by a Canada Research Chair (McMaster University). The authors declare that they have no conflicts of interest. This study received ethical approval from the Hamilton Integrated Research Ethics Board (Project #14-126). Statistics Canada. 2011 National Household Survey: Data tables. http://www12.statcan.gc.ca/nhs-enm/2011/dp-pd/dt-td/Rp-eng.cfm?LANG=E&APATH=3&DETAIL=0&DIM=0&FL=A&FREE=0&GC=0&GID=0&GK=0&GRP=0&PID=105392&PRID=0&PTYPE=105277&S=0&SHOWALL=0&SUB=0&Temporal=2013&THEME=95&VID=0&VNAMEE=&VNAMEF. Statistics Canada Catalogue no. 99-010-X2011030. Accessed on 5 December 2014. Tjaden P, Thoennes N. Extent, nature, and consequences of intimate partner violence. National Institute of Justice and Centers for Disease Control and Prevention. 2000. https://www.ncjrs.gov/pdffiles1/nij/181867.pdf. Canadian Orthopaedic Association. Intimate partner violence. Position statement. 2009. Retrieved from http://www.coa-aco.org/library/health-policy/intimate-partnerviolence.html.